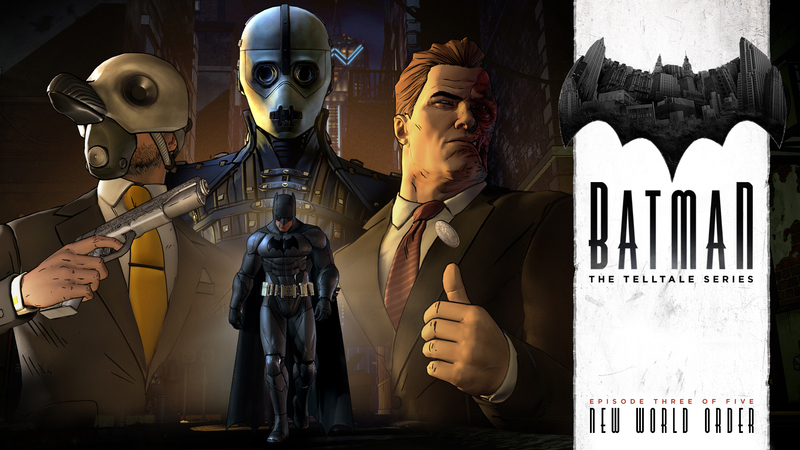 Reviewer's note: Welcome to the second part in our five-part series reviewing Batman - The Telltale Series, an episodic adventure game. Part one can be found here, part 2 here. This review will contains spoilers for episode 1 and 2! Picking up after the fairly surprising ending to episode 2, episode 3 continues to tighten the vise on both Batman and Bruce Wayne. Though Falcone and Hill are gone, the antagonists that truly threaten Gotham are revealed; the Penguin, and the leader of the Children of Arkham. But in the real world, Bruce Wayne faces just as much pressure in his support of Dent and the revelation that his father was involved in much of Gotham's corrupt past and the institutionalization of Cobblepot's mother. Episode 3 is very much like episode 2. More of Bruce's life crumbles around him, and you spend the bulk of it doing damage control. It's split fairly evenly between Bruce Wayne segments and Batman segments. There's a really thought-provoking segment that questions what Batman can do for the everyman. I love seeing that sort of questioning of the role of superheroes in the real world. However, as we get deeper into the game, I'm starting to notice some of the seams in the story. The decision between Dent and Catwoman near the end of episode 2 seems to be one of those illusory choices that come with offering two obviously different choices that lead to the same outcome. I chose Catwoman over Dent, but given the way episode 3 plays out, it would have to be a radically different structure if I had chosen Dent instead. This is not a complaint per se, but something we live with in Telltale games. While I continue to enjoy the game and look forward to the next episode, they still haven't ironed out the performance problems. There's one scene in particular that got real choppy. It still doesn't make sense. In classic Telltale style, episode 3 ends with another significant cliffhanger and teases an episode that I'm very much looking forward to. Despite the technical problems, Batman - The Telltale Series Episode 3 is great and it would take a really particularly bad episode to spoil the whole series at this point.